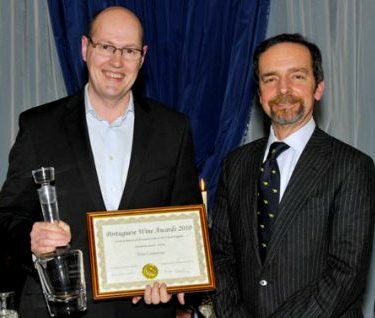 n 2010 I was honoured to be named as Portuguese Wine Journalist of the Year at a ceremony in the Portuguese Ambassador’s residence in London (right). One year on, and I returned to the Ambassador’s residence in June 2011 to present 50 wines that represented the culmination of my year of holding this title: my personal selection of 50 Great Portuguese Wines. Choosing the 50 Great wines was both a huge challenge, and an enormous pleasure. In six trips to Portugal between July 2010 and February 2011 I visited dozens of estates and tasted over 1000 wines. So narrowing down that 1000 to just 50 was a bewildering, difficult and at times exasperating task. I set some ground-rules for myself: one was to find examples of both the best ‘traditional’ and ‘original’ styles to include. I focused on wines from indigenous grapes, but did not to exclude blends or even varietal wines from international grapes if I felt they deserved their place. I also decided that I would include a maximum of one wine from any producer (even though there were often two or three wines in a range that were contenders), and that I would try to cover the gamut of table wine styles and regions that Portugal has to offer. Remember this list is my declaration of 50 Portuguese wines that I think are ‘great’. It is not a list of the ’50 best wines in Portugal’. Inevitably people will say “But how could he include X and not Y?” but that would entirely miss the point: Portugal has many more than 50 great wines, but this 50 is the selection that I wanted to put my name to. Another theme was to find freshness in the wines – red and white – to help dispel a somewhat outdated image that Portuguese reds can be rather hot and heavy in style. Note that Port and Madeira wines are not eligible for this selection. Some of these wines are not in the UK at present, but where known, links to retail stockists are given. Click the map for a larger, more detailed and more accurate version. Malvasia Fina and Encruzado. Organically farmed, this is fresh, fragrant and open, with some passionfruit and elderflower lift and pungency and a nutty element to the fat lemon fruit beneath. On the palate this has deliciously forceful fruit that is herbal, but ripe: it has a Sauvignon Blanc-like vegetal quality mixed with tropical fruit sweetness and displays masses of flavour. Big, powerful, but in the end, gracious. Malvasia, Encruzado, Bical, Sercial. Certified organic and grown biodynamically. Emerald green hue, fresh lemon and pear skin fruit. Fantastic intensity and punch on the palate, with real mineral streak and some skin contact giving grip. Orangy, bright with lovely tang and vibrancy, that gripping concentration of the fruit offset by ripeness so it does not lose charm. UK Importer: Raymond Reynolds. Alvarinho. Very rich, ripe quality, notes of buttered cabbage and quite exotic fruit, but all with a fine, nervy twist of dill-like herbs and minerals. The palate has a slightly oxidised, bruised fruit quality that I find Chenin-like, with lots of layered personality and a big, dry, phenolic but balanced finish. Only 500 cases made. Alvarinho. A singular take on Vinho Verde from Galician winemaker Marcial Dorado. It spends one year in tank with lees, and qualifies as a ‘Natural Wine’, organically farmed, very low levels of sulphur and all natural yeasts. Powerful, leesy, oxidative nose showing lots of stony minerality. This is intense, with concentrated green apple fruit, lots of structure and acidity gripping the finish. UK Importer: Indigo Wine. From vines planted on their own roots in Phyloxerra-free sand dunes. The nose is all hay, straw and underripe apple fruit, a really intriguing panoply of unexpected aromas. On the palate this is bone dry with pithy grapefruit, a salty tang of minerality and an ozone freshness. Singular, bone-dry stuff, out-Muscadeting Muscadet. Encruzado. A real speciality from the giant Sogrape company, aged four years in oak. Filled with custard and nutty aromas, with white fruit concentration beneath. The palate has that creamy textured richness from the oak and lees ageing, but what a delightful marzipan sweetness of the oak, ripe fruit and almondy flavours beneath. On the palate the waxy weight of the wine is cut by vivacious tangerine acidity. UK Importer: Stevens Garnier. Gewurztraminer, Riesling and Malvasia. There’s an exotic, smoky and spicy character with some herb and nettle beneath, and then some of Malvasia’s breadth begins to underpin. On the palate nectarine juiciness is layered with a smoky, mineral note, giving an intriguing combination of juicy sweetness and decisive clarity to the acidity. That herb and mineral note pushes though. Subdued, older character with little of the Muscat’s floral exuberance. Aromas are more of stewed tea and nuts, a little caramel. The palate has full sweetness, the marmalade orange tang and cappuccino richness of the wine giving huge depth and intriguing layers of contemplative complexity. A profound and deliciously alive wine. UK importer: Castas. Alicante Bouschet. Absolutely beautiful fruit on the nose, the sweet, elegantly minty blackcurrant soaring from the glass. A jammy ripeness, but such supple, lightly cedary and smoky elegance too. Deliciously drinkable, with plenty of tannin and biting acidity, but the sweetness and creaminess of the fruit overcomes it. International in style perhaps, but beguiling. Touriga Nacional. Big, meaty, minty nose, with huge cassis ripeness and fragrant, spicy edges too. It has fine sweetness and ripeness on the palate, with solid black fruit that has a cassis note, and the meaty depth playing against massive tannins and plenty of plum skin roughening grip. Long and fabulously focused. Uk Importer: Atlântico. Aragonez and Trincadeira, as well as Syrah and Cabernet Sauvignon. From schist slopes, this is bold and sinewy, with vine fruits and lots of chocolate-edged, plum and cassis. There’s a pencil-shaving quality of French oak layered nicely on top. The palate has delicious sweetness and ripeness, the mouth-filling espresso and cassis ripeness set against the creamy texture and silky tannin. International, but terrific. Uk Importer: Enotria Winecellars. Old vine Baga. Slightly closed at first, the black fruits and some supporting older oak add a little more giving roundness. There’s meatiness too. The palate bursts into life, with really sweet, punchy fruit that has a fleshy, creamy density. Touches of spice and liquorice from grainy but fine tannins and very good acidity. Fleshy, charming intensity of old vines. Trincadeira, Rufete and Touriga. Wonderfully inky, vinous nose, extremely muscular and sinewy with such solid black fruit, but edged with touches of kirsch and violet. There’s a little coffee and game adding yet another layer. Delicious palate, the pin-point accuracy of the fruit continues, with tight, glossy depth and that edge of muscular, tight tannin. Long through precision, not brute force. Touriga Nacional and others. Graphite and mineral character, with tight, glossy black fruit and those little floral highlights. The palate has lovely freshness, with juicy cherry and plum skin bite to the acidity. This is deliciously poised between juicy fruit sweetness and fleshy approachability, and that more brooding, tightly wound muscular concentration. Very nice nose here, with lots of spices and floral notes singing out, the Parma violet sweetness of the fruit is lovely. On the palate that purity and sweetness is compelling, the racy acidity and tannins just coaxing it along as the juiciness and bursting freshness of the fruit floods across the tongue. Expressive and vibrant. Touriga Nacional, Tinta Roriz, Jaen and Trincadeira. This is the epitome of savoury, meaty, dark and muscular red wine with a sinewy density to the aromas, just offering glimpses of bacon fat and earth, and savoury fruit. On the palate it has real presence and structure, the taut, smoky minerality and tightly-wound tannins softened by some cherry fruit and sour lemon freshness. Ince Wines. Old vines. A fragrant elegance to the obvious concentration of black fruit here. Very sweetly focused, the coffee bean and cassis fruit packed into the mid palate. Huge, impressive length, the tannins super silky and naturally concentrated. UK Importer: Bibendum Wine. Old vines. Dark, deep, limpid and vinous with black fruits and a savoury, spice and huge natural concentration. Glimpses of something more floral and aromatic are delightful. On the palate there is nothing aggressively extracted, but there is huge intensity. The fruit is svelte and taut, the tannins supple and the acidity integrated. Oak is meshed with the fabric of the wine seamlessly. UK Importer: Clark Foyster. Touriga Nacional, Tinta Franca, Tinto Cao, Trincadeira, Shiraz and Tannat. Cedary and elegant on the nose, with a certain meatiness but clear and fruity, lots of spice and subtle earthiness coming through. The palate has plenty of fruit: really bold and chewy, with big tannins adding a pleasant roughening texture. That bloody, gamey ripeness is there, with nice acidity into the finish too. UK Importer: Moreno Wines. Aragonez, Syrah, Touriga Nacional. The nose is quite discreet, with a cool, graphite minerality and sheen of tight-grained, cedary oak over refined black cherry fruit. The palate has creamy density, with sinewy texture adding lots of chewy grip, the tannins supple and chalky, but decisive and the acidity giving a keen edge. An intriguing and very composed wine. Touriga Nacional and Petit Verdot. Vine fruits and dark, mulberry and cassis richness set against some elegant, lifted floral character and plenty of pepper and spice. Sumptuous, broad mid-palate sweetness and juiciness. The Petit Verdot adds black fruit depth and a certain spicy tannin quality, and there’s an edge to all that full-throttle stuff. UK importer: Castas. Aragonez, Trincadeira and Grand Noir. Aged in 100% new oak for one year, then racked into another set of 100% new oak barrels. Massive balsamic nose with, with lots of high, almost gamy aromas, intense floral glimpses, schisty notes and charcoal. Very powerful palate too, with sweet balsamic grip, but liquoricy depth, length and focus. Layered complexity, and something intriguing about it.